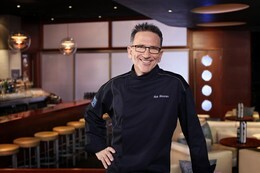 The ocean has a passionate advocate in Executive Chef Rick Moonen. The well-known chef has gained notoriety for both himself and the cause of sustainability through his tenacious and outspoken activism, bringing the issues of overfishing and ocean conservation into the kitchen. At RM Seafood, Chef Moonen introduces diners to his flavorful ideology with creatively approachable uses of eclectic, sustainably harvested fish that make his “mission statement…fun and enjoyable” instead of “pushing it down people’s throats.” The result is a dining experience that satisfies appetites and consciences alike. Chef Moonen’s culinary background reads like a who’s-who of American gastronomy. After graduating first in his class at the Culinary Institute of America, he worked the line at La Cote Basque alongside fellow acclaimed chefs, Charlie Palmer and Todd English, and later under the esteemed Alain Sailhac at Le Cirque. From Le Cirque, Chef Moonen took on the role of executive chef at a series of highly regarded restaurants including Le Relais, Chelsea Central, and the Water Club before moving on to become the executive chef and part owner of Oceana, where he earned the restaurant a coveted three-star rating by the New York Times. It was while he was working at Oceana that Chef Moonen was contacted by the “Give Swordfish a Break” campaign, which started him on his ocean conservancy crusade. He took this passion with him to Molyvos, a Greek fish house, earning it the title of being the first three star Greek restaurant in New York, before opening his own restaurant, RM Seafood. Since first being contacted by “Give Swordfish a Break,” Chef Moonen has acted as a powerful environmental advocate, using his culinary stardom to draw attention to the plight of the world’s oceans and fish populations. He is as active in the political sphere as he is in the kitchen: testifying in Washington D.C. for sustainability and environmental issues on numerous occasions, helping to found Seafood Choices, acting on the chef’s advisory board of Ecofish and as a member of both the Wildlife Conservation Society and Seaweb. His criticism of fellow chefs who ignore their impact on the earth’s oceans has earned him somewhat of a notorious reputation in the culinary sphere. Chef Moonen jokes about his effect on other chefs: “Moonen’s coming to tell me to take something off the menu; don’t make eye contact!” This fear-inducing reputation is perhaps not entirely exaggerated, since he shows little patience for chefs who continue to use overfished and endangered seafood out of habit: “if you can’t be creative and can’t think outside the box, then you’re not really a chef.” Leading by example, Chef Moonen uses a wide array of lesser known and less popular sustainably harvested seafood varietals in his RM Seafood menu like cobia, catfish, and kampachi.